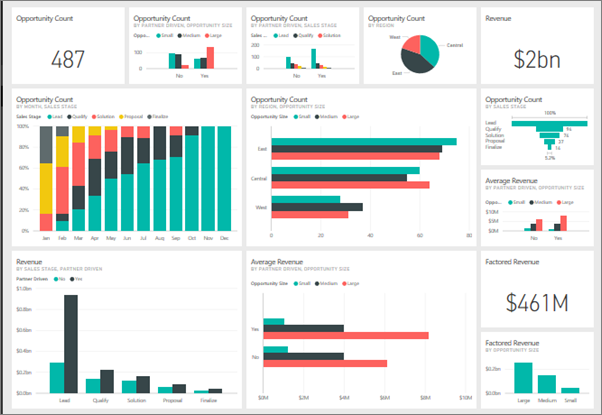 A Power BI dashboard is a single page, often called a canvas, that uses visualizations to tell a story. Because it is limited to one page, a well-designed dashboard contains only the most-important elements of that story. 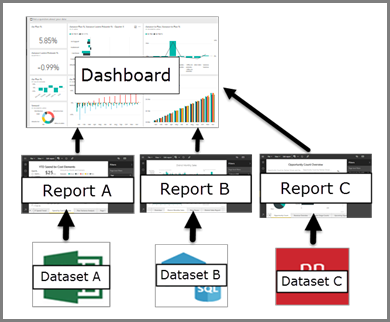 The visualizations you see on the dashboard are called tiles and are pinned to the dashboard by report designers. Selecting a tile takes you to the report page where the visualization was created. If you're new to Power BI, you can get a good foundation by reading Power BI basic concepts. Dashboards can be viewed and shared on mobile devices. Power BI Pro is required for viewing a dashboard that has been shared with you. The visualizations on a dashboard come from reports and each report is based on one dataset. In fact, one way to think of a dashboard is as an entryway into the underlying reports and datasets. Selecting a visualization takes you to the report (and dataset) that was used to create it. Dashboards are a wonderful way to monitor your business, to look for answers, and to see all of your most-important metrics at a glance. The visualizations on a dashboard may come from one underlying dataset or many, and from one underlying report or many. A dashboard can combine on-premises and cloud data, providing a consolidated view regardless of where the data lives. A dashboard isn't just a pretty picture; it's highly interactive and highly customizable and the tiles update as the underlying data changes. Reports are often confused with dashboards since they too are canvases filled with visualizations. But there are some major differences from a Power BI consumers point of view. Learn about dashboard tiles and what will happen when you select one. Have fun asking your dashboard questions. Learn how to use Power BI Q&A to ask a question about your data and get the answer in the form of a visualization. If you didn’t find what you’re looking for here, use the Table of Contents to the left.